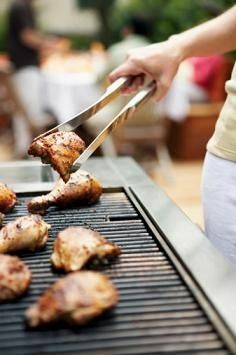 All About Food: Outdoor Grilling Tips - Should I Barbecue or Smoke? Outdoor Grilling Tips - Should I Barbecue or Smoke? Barbecuing is an art. When it comes down to it, there's some tricks to the trade that you need to know up front. Someone who is completely new to it might get a little impatient at first. But In order to get great tasting BBQ, you have to have some patience. It's not as easy as just slapping a piece of meat on a flaming grill top and yanking it off 5 minutes later. There's more to it than that. Barbecuing can be done a couple of different ways- it can be grilled or smoked. Grilling is done in two ways - the direct method and the indirect. But before going into these specifics,lets talk about the two different types of grills: charcoal and gas. Charcoal grills are usually pretty inexpensive. All you need is a cheap grill or some other metal container that will hold the charcoal under a grill top. Gas grills can range in price from the economical to the very expensive with all the bells and whistles. Some high end gas grills come with additional features like boilers and smokers. When you're cooking on a grill, you ant to start by placing the meat directly over the flame, in order to seer it to seal in the flavor. After a few minutes of sitting directly over the fame on both sides, you want to move it to an area of the grill that doesn't have a heat source directly hitting it. The sauce is the most important ingredient right? The very best time to apply sauce is during the last stage of cooking the meat. Sugar is one of the main ingredients in most barbecue sauces, and it burns fast so you want to make sure that the meat is well cooked before applying the sauce. Slow Smoking is one of the best ways to cook food, even though can take some time. You really have to have a lot of patience if you want to smoke. Smoking is usually best for cooking larger pieces of meat like roasts, ham, ribs, and brisket. You have to maintain a steady temperature if you want to come out with perfectly smoked meat. You normally want the temperature to be around 225 degrees. When it comes to smoking you have to make sure you are using the right king of wood. Different smokers will vary in shapes and sizes. There are smokers running in gas and charcoal.The heat coming from the smoker is not nearly as hot as when grilling so it takes some time.